The history of Arkansas' newspaper, the Arkansas Democrat-Gazette, begins in the wilderness at Arkansas Post. At a clearing in those dense woods the Arkansas Gazette was born in 1819, at a simple frontier time when Arkansas was still a young territory, not yet a state. Half a century later the Arkansas Democrat came into being, born of the turbulent politics of the defeated, war-ruined South. Together they dominated the newspaper landscape of Arkansas for more than a century. Today they survive and thrive as one -- the oldest continuously published newspaper west of the Mississippi. ACH is home to some of the finest medical professionals in the world. Arkansas' children get wonderful healthcare here. Find out more about this great facility at http://www.archildrens.org. SP had a great time in the Rivermarket. There's so much to see and so much to do. Inside are some of the best eating places you've ever seen. All kinds of cuisine in there. And lots of people. You're sure to run into someone you know or even someone famous. SP, in just a short while met a famous playwright, a local radio personality (that's right, Kara Bibb, http://www.kabf.org/?page_id=659), a singer/songwriter, and a beautiful little one year old and her mother from NEW YORK CITY! With all the appearances of Santa Pete at Holiday Open Houses and other events around Little Rock and Central Arkansas, I thought I should have my own bench. When you have your picture taken with Old SP, the chair has to be pretty, right? Well, no need to worry about that, my friends. Mrs. SP made such a pretty suit that I wanted to bring more than just hair and a beard to the table. So, I've built a pretty bench to use at events that need them. Check out these pictures of the building process, and a few of the finished product. While visiting the Old Statehouse, SP ran across some interesting people. Yes, that's Roseanne Cash, who was very excited to have her picture taken with someone famous. Little Rock is a great city. We've got hills. We've got a beautiful river. We've got beautiful buildings. We've got history. We've got wonderful hospitals, physicians, therapists, and nurses. We've got vibrant churches. We've got beautiful parks. But, most importantly, we've got the best people in the world! Santa Pete LOVES Little Rock. That's why, starting today, it's COUNTDOWN TO CHRISTMAS IN LR! Every day during December, we'll be posting something interesting about Little Rock. Little Rock is the capital and the largest city of the state of Arkansas. Including North Little Rock, it is home to 261,170 people. It is the county seat of Pulaski County. Located in the geographic center of Arkansas, Little Rock derives its name from a small rock formation on the south bank of the Arkansas River called la Petite Roche (French: "the little rock"). French explorer Jean-Baptiste Benard de la Harpe (his buddies just called him JBBDLH) is the one credited with naming Little Rock in 1721. Explorers and early settlers called it The Little Rock to distinguish it from the big rock upstream. The “big rock” was once used as a rock quarry. The “little rock” marked a popular crossing place in the river, and a settlement grew in that place. Today, you can see a piece of the Little Rock at the north end of Rock Street near the History Pavilion in Riverfront Park. Today, the Arkansas Razorbacks hosted the Mississippi State Bulldogs at Little Rock's War Memorial Stadium. Santa Pete decided to go see some tailgaters, while he was out and about. WPS! Last Sunday evening, Santa Pete made a visit to the Picker/Cheatham House Church, which is part of Little Rock Church. The children were all dressed up. Their parents brought refreshments. The room was decorated beautifully, with a Christmas tree and everything. The kids all gathered around the tree on the floor, waiting for Santa Pete to come. When SP arrived, they all called out, “Santa Pete!” SP got down on the floor with them, and they all sang some songs, Jingle Bells, Rudolph, and Deck the Halls. Then they listened closely to Santa Pete, while he read a short Christmas story. SP had brought a small gift for each child. The children were called one by one to come and sit in Santa’s lap, where they unwrapped their little gift. Then, they each spent a moment or two talking to Santa. Most of them gave him a hug when they were finished. After all the pictures were taken, and the Santa visits completed, everyone enjoyed cookies and milk. Oh what fun they had! The story of Santa Pete began last Christmas when my daughter called me to tell of her trip to visit Santa with her three children. Although he was a delightful man, she was weary from the long lines and time spent for just a few short minutes with Santa. During our conversation she said, "Hey! You should be Santa Pete! The kids would love you!" I usually agree with many of her suggestions, so I decided to begin the process of transforming into Santa Pete. My wife was excited at the idea of Santa Pete and began looking at Santa suits. After ordering one suit, she decided that it would be better to create the suit herself. You can see by the photos, she created a fantastic suit for old Santa Pete. As my hair and beard began to grow a little longer, my friends and co-workers wondered if I was having a mid-life crisis, but when I told them I was going to be Santa they were excited about the potential. During the long summer, I found myself questioning my decision to do this. This hair and beard are HOT in the Little Rock summer! I found it was difficult to stay cool, but I decided that being Santa Pete was worth a temporary discomfort. 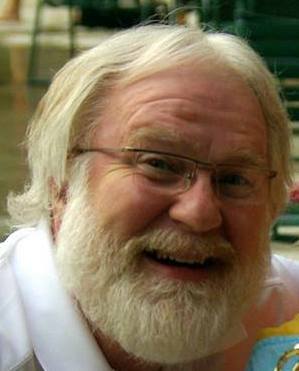 As the summer months wore on and my beard and hair got longer, I started to believe more and more - I AM SANTA PETE!. Even my friends were surprised and suggested that I could play Santa for our church, and take donations for a ministry. We considered several ministries, but we decided to raise money for The Call, which is an agency dedicated to the care of foster children in Central Arkansas. On December 14th, Santa Pete will be at Little Rock Church, and visit with the children of The Call. Then, the next day, December 15th, Santa Pete will again be at Little Rock Church to visit with children of the church. Donations will be taken on both these days. David Cranford will be on hand both days to take photographs. Each child will receive a free photo. You can also visit David's website, www.davidcranfordphotography.com to purchase Santa Pete prints, cards and other Santa Pete items, with all profits going to The Call of Arkansas. Welcome! I am so excited you have come to visit my website. When this all began I was looking to be Santa for a few friends and family. As the beard and hair grew and I put on my Santa Suit, I realized that this was more than just a few photos and visits with old friends. This was something that I could do to bring joy and holiday cheer to young and old in Little Rock and Central Arkansas. With several events already planned, I am looking forward to sharing the adventures of Santa Pete. I hope that you will come back and read of my tales and if you’re looking for a jolly Santa for your holiday party or event, please contact me.